After three straight articles discussing the poor state of the Pac-12 Conference, I decided it was time to get back to writing something fun. I had originally used the word “important” in the title instead of “influential.” But, out of fear that there would be a reader revolt clamoring that Marcus Mariota was unquestionably most important Duck ever, Charles Fischer recommended that I go with “influential,” as this word would put a whole different spin on the discussion. My article also had a nice comment by FishDuck.com’s own Bob Rickert, who attended classes at Oregon with Miller. I also crammed as much into this article as I could since I didn’t know if I was ever going to get to write again for FishDuck.com again. In the Oregonlive.com piece, Ken Goe gives a summary of a recent article off of The Athletic (by former Oregonian reporter Tyson Alger) that ranks the Top 10 quarterbacks in Oregon history. The article had Miller at No. 10, which Goe correctly felt was too low. Miller and Mariota played almost 30 years apart. So, head-to-head statistical comparison are meaningless. Had Miller played in the Chip Kelly era, he would have thrown a ton more touchdowns, fewer interceptions, and run for many more himself. Keep in mind that while Miller didn’t have the top-end speed of Mariota (how many QB’s do? ), he was a tremendous three-sport athlete in high-school. Miller was drafted in baseball and would have garnered a D-1 scholarship in hoops had he had the interest. Essentially, in the city of Eugene, he was a poor man’s Danny Ainge (Wink-wink, yes Ainge and I are fellow North Eugene graduates). The point being, Miller would have done quite nicely in a modern college football offense. What I’m going to do is rank the top Oregon quarterbacks in the Modern Era of Oregon Football, which coincidentally, coincides with my own life. 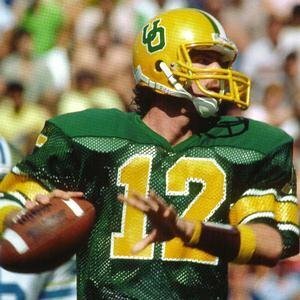 I believe most FishDuck.com Greybeards would agree that the modern era of Oregon Football began in 1977, the year Rich Brooks became head coach. I was born in 1974, and like most people, I don’t remember anything before the age of four. But, I do distinctly remember my dad talking about Oregon football in 1979, particularly about this dynamic junior-college transfer quarterback named Reggie Ogburn. Akili Smith: 3rd overall pick in 1999 NFL Draft. Then, in 1980, I of course remember going to my first game when I witnessed Ogburn complete a pass to himself; as well as listening to the Ducks beat the Huskies on the radio that same season and watching my Dad and big brother dance for joy. I was essentially ingrained in Oregon football from the very start of my life, right there with the beginning of the modern age of Duck football. The list is obviously very subjective. I combined the several factors: Talent, durability, “it” factor, leadership, impact on Oregon football, legend, maximizing talent around him, etc., and finally, the most subjective factor of all: my gut feelings. 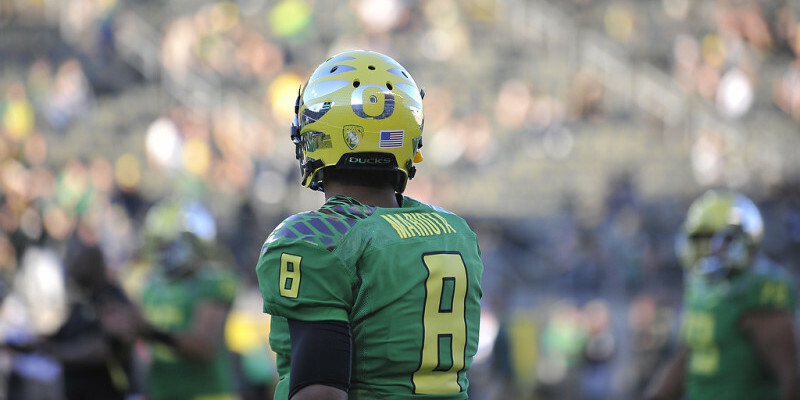 1) Marcus Mariota, 2012-2014: No argument here, he is the best player in Oregon history. 3) Bill Musgrave, 1987-1990: He didn’t have the tools of Miller, but highly intelligent and had the “it” factor. Had it not been for season ending injuries in 1987 and 1988, he probably goes to No. 2 on this list, and dare I say maybe gets some votes for the top spot. 4) Joey Harrington 1999-2001: I remember sitting in the stands against Arizona State in 1999 when he came in to relieve A.J. Feeley and immediately proceeded to throw a touchdown right in front of me in the southeast corner of the stadium. The Ducks never looked back for the next three seasons as they went on to reach unprecedented heights in 2001. Danny O’Neil led the Ducks during the magical 1994 Rose Bowl season. 5) Dennis Dixon, 2006-2007: After an uneven and sub-par 2006, new offensive coordinator Kelly got the very best out of Dixon in 2007 and a season to remember. If not for the injured knee, the Ducks might very well have won it all that year. 6) Darron Thomas, 2010-2011: He was the starting QB for two of Oregon’s best teams ever. Thomas didn’t have a top-shelf skill-set, but he was a good decision maker and the right guy at the right time to drive Kelly’s Lamborghini of an offense. 7) Reggie Ogburn 1979-1980: Ogburn was a magician on a couple of sub-par Oregon squads but single-handedly gave Oregon fans hope of an upset every single game. After a 6-3-2 1980 season, Oregon fell flat in 1981 and 1982 to a 2-9 record both years. But, Ogburn did give Oregon fans something to cling to until Miller arrived in 1983. 8) Jeremiah Masoli, 2008-2009: Kelly’s first QB as head coach gave him all the tools to run the hurry-up offense. He could run like a running back and was an adequate enough passer to keep opposing defenses off balance. 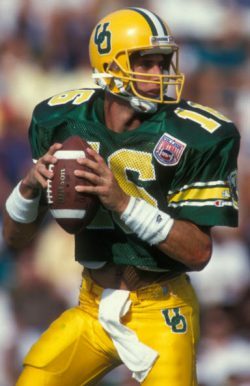 9) Danny O’Neil 1991-1994: Not the most physically gifted quarterback, he walked in trying to replace two recent legends in Miller and Musgrave — not an easy task, as the Ducks weren’t the most talented his first two seasons, but of course were “rebuilt” in time for the magical 1994 season. 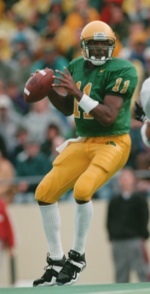 10) Akili Smith 1997-1998: After splitting time with Jason Maas in 1997, Smith quarterbacked the most explosive Oregon offensive ever up to that point. The Ducks looked like sleeper national title contenders until things fell apart in the second half of the season. But, nobody can deny Smith’s dominating season. 11) Kellen Clemens 2002-2005: Similar to what O’Neil experienced a dozen years earlier, he walked into a situation of replacing a couple of back-to-back Oregon legends while dealing with an exodus of talent from the Harrington era. Clemens, like O’Neil, was a four-year starter who progressed nicely as a player as he topped off his Oregon career in 2005 with a 10-1 regular season. 12) Tony Graziani 1995-1996: Coming off the 1994 Rose Bowl season, Graziani inherited a still talented 1995 team that was headed back to Pasadena. That was until the Ducks rolled snake eyes against the slithery ASU legend Jake Plummer in a loss that cost the Ducks back-to-back Pac-10 titles. Looking over the list, it really is a tribute to the quality of quarterbacks that Oregon has had in this modern-era when guys such as O’Neil, Smith and Clemens are toward the bottom of the list. 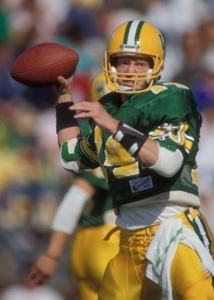 The Ducks were extremely fortunate — especially during the Brooks years — to have excellent quarterback play to offset the overall lack of team talent. Without those early excellent quarterbacks, Oregon football wouldn’t be the elite program that it is today.